Garlic is a wonderful crop for those of us looking to stock up on our homegrown produce and to spice up our menu without relying on expensive (and none-too-fresh) packaged spices. With the proper care, garlic can be stored for up to a year. 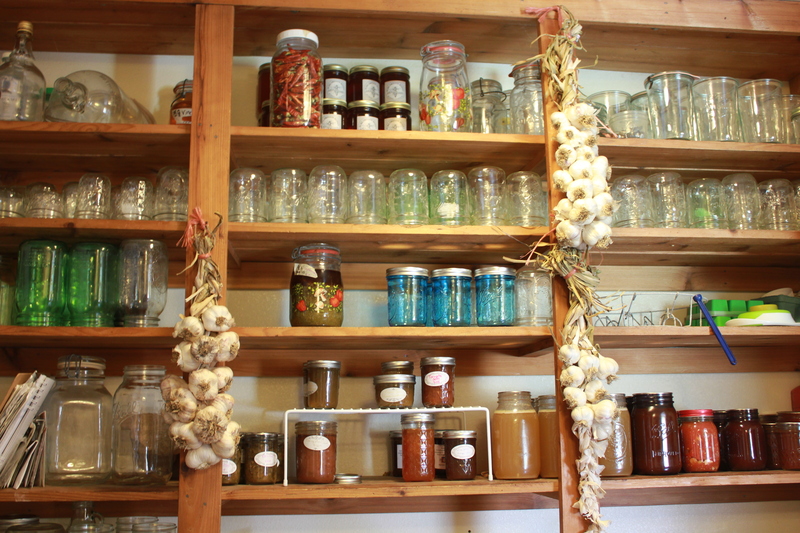 Here are some of my favorite ways for storing my garlic harvest. Hardneck garlic has a much shorter storage life than its softneck cousins. The cloves are larger and more flavorful than most softneck varieties, making hardneck garlic the perfect candidate for dehydration. 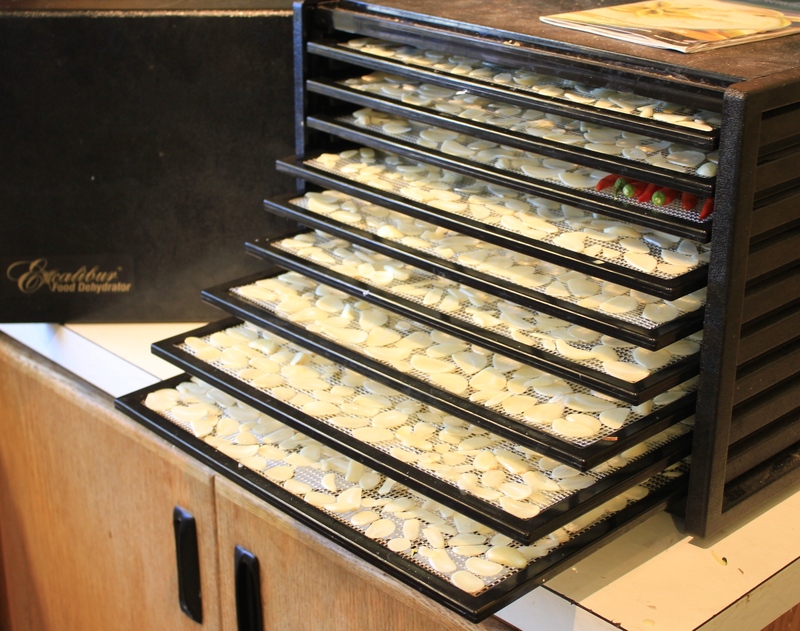 What, you don’t think that hand slicing hundreds of cloves to fill your dehydrator is the best idea for a fun afternoon? I have a partial solution for the chore: I picked up this handy miniature mandolin/Garlic Slicer made specifically for slicing garlic. I LOVE it. It works really well and creates perfectly even slices of garlic for efficient and safe dehydration – it’s always best to slice vegetables evenly so that all pieces get fully dried. We filled my Excalibur in a few hours then set it to dehydrate at 115 degrees for around 12 hours. Test a slice to be sure they’re dried brittle and add more time if not. I store my garlic in glass jars and grind for powder in smaller batches closer to use: garlic powder has the tendency to clump. Hardneck garlic also makes killer roasted garlic. Just wrap each bulb in foil with a bit of olive oil and toss them in the oven when you bake your next meal. Spread on bread, meat, or stir into sauces. However you enjoy your garlic: use the hardneck first and then move onto your softneck varieties. Softneck garlic: Those soft necks sure braid up nicely! 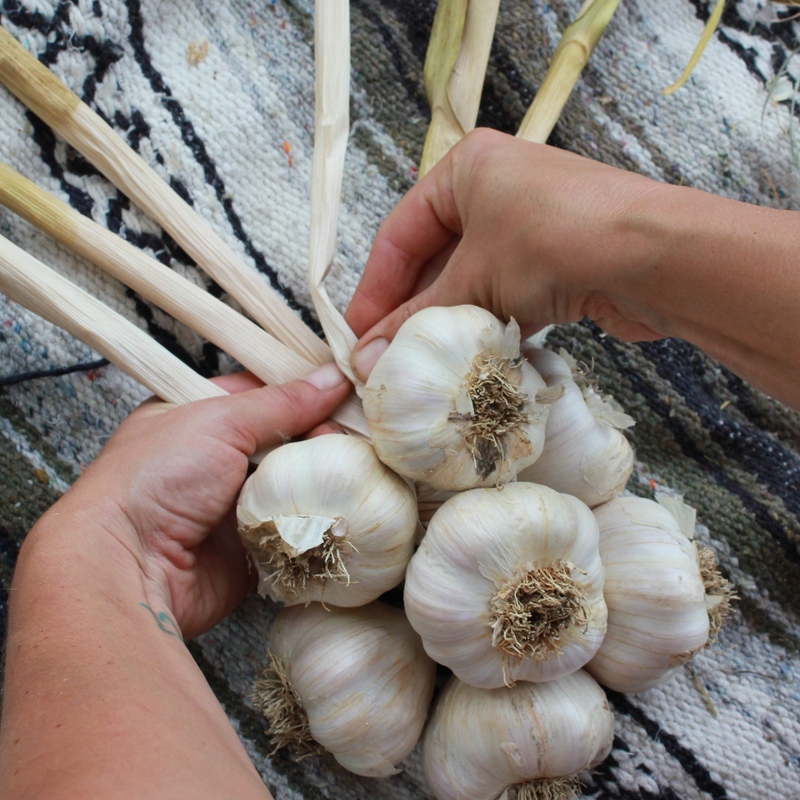 The obvious way for storing softneck garlic is to braid it! All your garlic should be cured for about a month somewhere well ventilated and shady before long term storage. Set aside all the biggest bulbs to plant this fall, but store the rest of the softneck varieties in beautiful braids. Store the braids out of direct light for best storage. Visit this post for complete, illustrated instructions! When properly cured and stored some varieties of garlic can last in your pantry for over a year. If you notice any green shoots – use those bulbs up asap. Also watch for pithy bulbs or any mold and remove those from the others quickly. Garlic needs ventilation and a dark, cool place to store best. Never store your garlic in plastic and avoid storing near onions or potatoes.